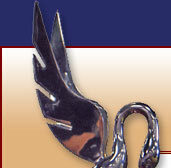 the official newsletter of Northern California Packards is the Pious Pelican. It is published and sent to members every two months. Below is an article from a recent edition. If you would like to see more, consider becoming a member. Our Membership page has all the information you need. As the Packards arrived, club members socialized while Chairman Larry Nannini and his wife Susan assisted the caterers in setting up a wonderful lunch in our covered pavilion. Mark & Kay Barchas' '36 120 won people's choice 3rd place. This year's picnic went really smoothly. We had a very nice turn out of members and Packards. 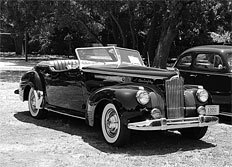 We had a total of seventeen cars which is the best turn out in the four years of the picnic. We also had eight new people attend who hadn't been here previously. The weather this year was just right and not too warm. We used Austin's catering again and I would have to say they outdid themselves. Everything was excellent and included table cleanup as we finished eating. One of our members signed them up for an upcoming event as their prices are right and so is their food. We were served lunch at 12: 30 pm with plenty of food for seconds, and everyone was finished by 1:30 pm when I started the program. Our first item of business was to announce the winner of the "Spark Plug" count contest. This year I brought back the container I had last year with a few less plugs. They get heavy lugging 480 plugs around. The "Spark Plug Contest" was won by Jerry Wuichet, whose count of 460 was the closest to the actual count of 480. 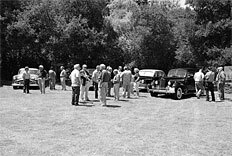 Next on the agenda was the "Car Trivia Quiz" which was won by Fred Hill. 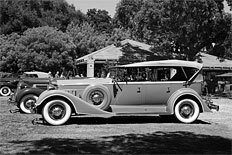 This year's quiz was multiple-choice with a couple of fill-ins; but no Packard questions. The "Car Picture I.D. Event" this year was shortened by half. We had only sixteen cars to identify, plus a bonus if you could guess the years. We didn't have John Kilkenny who guessed 30 out of 32 cars last year, so the field was open for all contenders. It was won by three-year attendee Charlie Barnett. All of the winners were given nice prizes for their accomplishments. 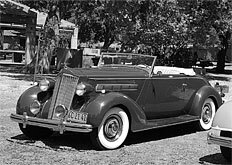 The winners of the "People's Choice" car show were as follows: Third place, Mark & Kay Barchas with their 1936 120 convertible coupe, Second place: Don & Glenda Sears with their 1941 Darrin convertible, and BEST OF SHOW: Charlie Barnett with his 1934 Super 8 7-passenger touring. Congratulations go out to all our winners in their respective events. It was nice to see the members linger after lunch in the pavilion and around the Packards talking shop and kicking tires. I'm sure everyone had a good time at this event, an annual event that is social in nature where we can enjoy one another's company and eat to your hearts content. It is fitting at this time that I thank my partner in crime, my wife, for helping me plan this year's picnic. Susan always helps when asked. Thank you...Susan. I would also like to thank Becky Schuette and Mark and Kay Barchas with helping us correct the quizzes. I would like to take this time to extend a thank you to all of those members and friends who helped support this year's picnic and to thank those first timers for attending this year's event. I hope to see even more members at the picnic next year.